Citi Octopus Credit Card combines credit card with the Octopus function in one card. With both swipe and "dood" functions, you have the flexibility to enjoy rewards everywhere you spend every day. Together with the 15% KMB, LWB, CTB and NWFB Bus Fare Rebate offer, start your journey on a happy note every day! NEW customers click here to apply for card now to enjoy fabulous welcome offers. EXISTING customers click here to register for 15% KMB, LWB, CTB and NWFB Bus Fare Rebate offer! Upon fulfilling the relevant spending conditions within the first 2 months from the date of card issuance. 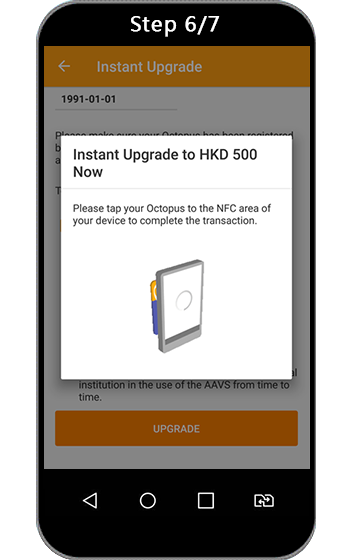 ^New customers, upon card issuance, are required to register for the promotion via the Octopus website (www.octopus.com.hk/aavs) on or before June 30, 2019, activate the Automatic Add Value Service and perform an auto-reload once on or before July 31, 2019 to enjoy up to HK$150 O! ePay Credit. HK$150 O! ePay Credit is only applicable to customers whose last successful automatic reload transaction amount is HK$500 on or before July 31, 2019. This promotion is organized by Octopus Cards Limited. Citibank (Hong Kong) Limited shall not be responsible for any matters in relation to this promotion. Other terms and conditions apply. For details, please visit the Octopus Cards Limited website www.octopus.com.hk/aavs. From now to December 31, 2019, Citi Octopus Platinum Cardholders can enjoy 15% KMB, LWB, CTB and NWFB Bus Fare Rebate upon accumulated retail spending of HK$1,500 per month. The rebate is an Octopus Cash Rebate which will offset Octopus Automatic Add Value Service (“AAVS”) transactions. Register now to enjoy the offer! The embedded Octopus Service in your credit card lets you spend whenever and wherever you desire. The Octopus Cash Rebate earned will offset Octopus Automatic Add Value Service ("AAVS") transactions, no registration is necessary. No cap on Octopus Cash Rebate. 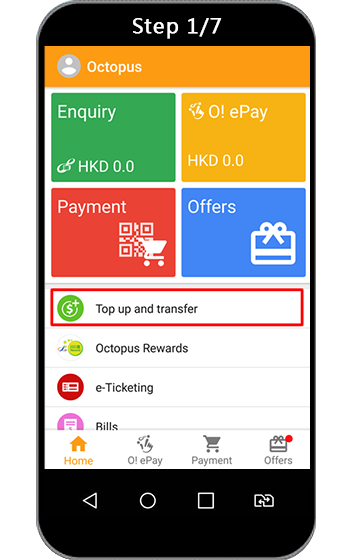 When your Octopus balance is running low, HK$250*/HK$500 will be automatically reloaded to your card. It's simple to use and you'll even earn Octopus Cash by topping up your balance. 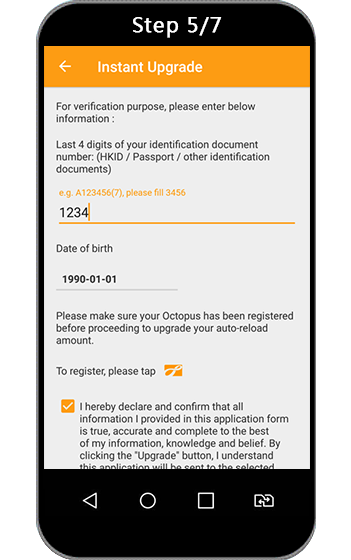 ^Only applicable to Near Field Communication (NFC)-enabled Android mobile device or iOS mobile device connected with Octopus Mobile Reader. *Effective from July 22, 2018, a HK$500 Octopus AAVS auto reload amount will be automatically assigned to all new Citi Octopus Credit Cardholders. Every time you spend on your card, you'll automatically earn Octopus Reward$ at designated Octopus Rewards Merchants. You can enjoy an array of dining and shopping privileges across the town. Applying online for an Citi Octopus Credit Card is easy. 1. How can I activate my Citi Octopus Credit Card and Automatic Add Value Service (“AAVS”)? Please download/ open the “Citibank HK” App and tap “Activate your card” to complete the new card activation process. * AAVS Activation Letter will be received within 5 working days after Credit Card activation and valid within 30 days after letter issuance. 2. What should I do if my Citi Octopus Credit Card is lost or stolen or captured at ATM? If you want to report loss, please immediately call our CitiPhone Banking at +852 28600333 and request for a replacement card. You will need to bear loss arising from unauthorized use of Octopus by others (including AAVS transactions) for the first three hours after successful report loss. The remaining value stored on the lost Octopus Card three hours after successfully reporting the loss (either positive or negative except zero value) will be refunded and posted into the Principal Cardholder’s Credit Card account. This will be reflected on the monthly statement within two months of successfully reporting the loss. 3. I have replaced my Citi Octopus Credit Card. How can I get back my remaining stored value in my previous card? The remaining Octopus value (either positive or negative except zero value) will be posted into the transferred Principal Cardholder’s Credit Card account. This will be reflected on the monthly statement within two weeks of card replacement. 4. How can I earn 15% KMB, LWB, CTB and NWFB bus fare rebate? The 15% KMB, LWB, CTB and NWFB bus fare rebate offer is only applicable to Citi Octopus Platinum Cardholders. You need to first register for the offer here and meet the required eligible retail spending of HK$1,500 per month to be eligible for the 15% KMB, LWB, CTB and NWFB bus fare rebate. 5. Which transactions are considered as the ineligible retail spending for the 15% KMB, LWB, CTB and NWFB bus fare rebate promotion? Ineligible transactions include, but are not limited to, Octopus Automatic Add Value (AAVS). Click here for the Terms and Conditions. 6. When will I receive my 15% KMB, LWB, CTB and NWFB bus fare rebate? Bus fare rebate will be credited to your Citi Octopus Credit Card account in 3 months after each respective month. 7. What is Octopus Cash Rebate and how does it work? Each Citi Octopus Credit Cardholder can earn Octopus Cash with each of your Octopus Automatic Add Value Service (AAVS) transactions and retail spending. The Octopus Cash earned will offset AAVS transactions posted to any subsequent monthly statement. 8. How to trigger AAVS reload transaction on my Citi Octopus Credit Card? 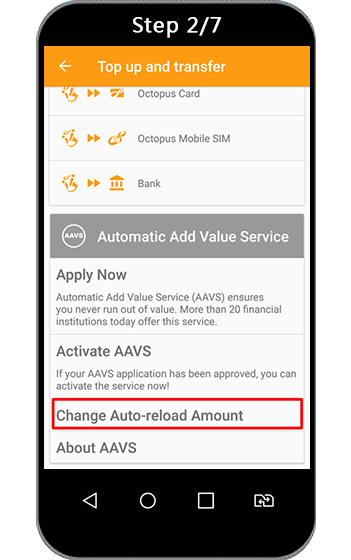 The first AAVS reload transaction will be triggered upon your first spending with Octopus. 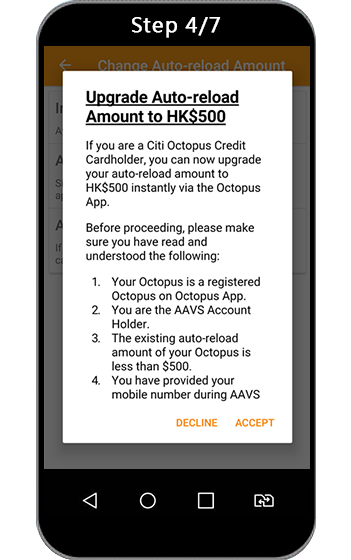 HK$500 AAVS amount will be automatically assigned to all new Citi Octopus Credit Cardholders. The reload amount will be posted to your Octopus Citibank Principal Credit Card account after every AAVS transaction, which will be clearly shown in your monthly statement. After that, when the remaining value plus maximum negative value on your Octopus is insufficient to settle the full cost of the transaction, Octopus will automatically trigger an AAVS transaction. 9. What is the maximum frequency of AAVS transaction can I make every day? Maximum one AAVS reloading per day. 10. 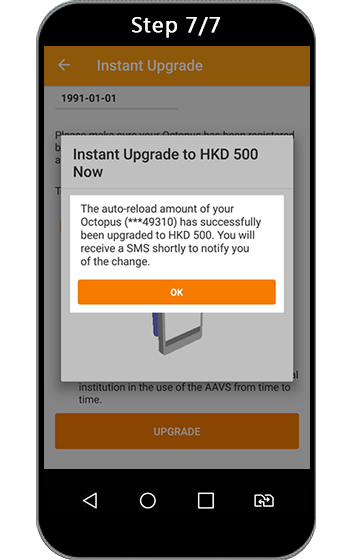 How can I use the Instant Upgrade service on Octopus App? 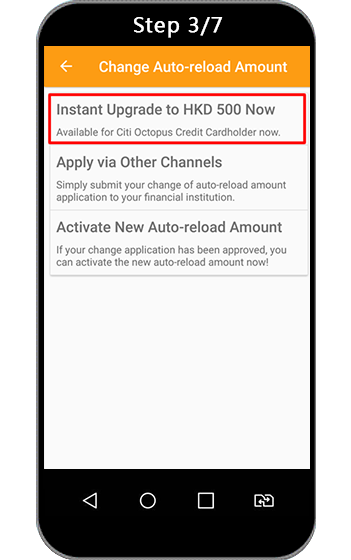 Only Citi Octopus Credit Cardholders are eligible for Instant Upgrade on Octopus App at current phase, and you may upgrade your auto-reload amount to HK$500 on Octopus app with an NFC-enabled Android mobile device. For details, please visit Citi Octopus Credit Card page. 11. I am an existing Citi Octopus Credit Cardholder. How can I earn and spend Octopus Reward$ with my Citi Octopus Credit Card? Citi Octopus Credit Cardholders are automatically registered for Octopus Rewards Program. When you pay with your Citi Octopus Credit Card, you earn Reward$ automatically. You will earn at least 0.5%# Octopus Reward$ every time you spend at the Designated Reward$ Merchants. Your accumulated Reward$ can be used to offset your spending at these shops at rate of Reward$1 to HK$1. Just let the cashier know you’ll be using Reward$ and tap your Citi Octopus Credit Card on the Octopus reader. # Minimum spending for earning Reward$ is HK$2. Reward$1 will be earned for any purchase value of HK$200. For Octopus Rewards Program related enquiries, please visit Octopus Rewards Page or contact Octopus at +852 36901313. 12. My Citi Octopus Credit Card is lost or replaced or malfunctioned, what will happen to my Octopus Reward$? If the Card is reported lost, is replaced or suffers a malfunction, any remaining Reward$ will be transferred to the replacement card. Primary or Supplementary cardholders can download the remaining Octopus Reward$ at any Octopus Rewards Stations with your new card between the 20th and the 50th day after your credit card is activated, otherwise the Reward$ will be forfeited without prior notice. For Octopus Rewards Program related enquiries, please visit Octopus Rewards Page contact Octopus at +852 36901313. **All welcome offers are only applicable for New Citi Credit Card Customers. New Citi Credit Card Customers ("New Customers") are defined as applicants who do not currently hold and/or in the past 12 months have not been successfully approved for or cancelled any Principal Citi Credit Card, Citi Cobrand Card, Citi Private Label Card issued by Citibank (Hong Kong) Limited and / or Diners Club Card issued by Diners Club International (HK) Limited ("Diners"). The promotion period of this Promotion is valid from January 1, 2019 to December 31, 2019, both dates inclusive (“Promotion Period”). The Promotion Period is based on transaction date. This Promotion applies to the Cardholders of Citi Octopus Platinum Credit Card ("Cardholders") issued by Citibank (Hong Kong) Limited (“Citibank”) (“Designated Credit Card”). This Promotion shall supersede Citibank’s “15% KMB and LWB Bus Rebate Promotion” as from and including January 1, 2019. Cardholders are required to register ONCE successfully by entering the Principal Designated Credit Card number and confirming all terms and conditions listed on the Designated Registration Page (www.citibank.com.hk/octopus) within the Promotion Period (“Registration”) to be eligible for this promotion. Upon registration, all supplementary cards under the Principal Cardholder will be automatically registered. Notwithstanding the foregoing, Cardholders who have previously successfully registered under the “15% KMB and LWB Bus Rebate Promotion” will be automatically registered for this Promotion. Starting from the first day of the calendar month during which the Cardholder completes Registration (“Registration Month”) until the end of the Promotion Period, Cardholders can earn 15% Octopus Cash Rebate (“Rebate”) on payments with the Octopus function of the Designated Credit Card on the bus services provided by The Kowloon Motor Bus Company (1933) Limited (“KMB”),Long Win Bus Company Limited (“LWB”), Citybus Limited (“CTB”) and New World First Bus Services Limited (“NWFB”) in Hong Kong (“Bus Payments”) in each calendar month upon making Eligible Transactions of HK$1,500 or more in the respective calendar month. The Promotion is not applicable to ticket purchases for Bus Payments made at (a) ticket office of New World First Ferry Services located at Central Pier 5 and 6, or (b) 7-Eleven convenience stores. Each Designated Credit Card account, including supplementary card will be entitled to a maximum of HK$300 Rebates in each calendar month during the Promotion Period. This promotion applies to “Eligible Transactions” made by the Designated Credit Card during the Promotion Period, including all local and overseas posted retail transactions, monthly installments of newly billed interest free installment plan that are also posted during the Promotion Period and cash advances made in Hong Kong Dollars, Renminbi, Macau Patacas and overseas in foreign currencies. The following types of transactions are not Eligible Transactions for the purpose of this promotion: “Dynamic Currency Conversion transactions”, i.e. transactions with conversion from a foreign currency into Hong Kong Dollars involved at the point of the transaction; Octopus Automatic Add Value Service transactions ; withdrawal amount/loan amount under the Balance Transfer Program, Cash Conversion Program, Flexi-Installment Program and/or Quick Cash Installment Program; payment to the Inland Revenue Department; bill payment; utilities payment; auto payment; mutual funds payment; fees and charges; insurance transactions; casino transactions; transactions through Faster Payment System (FPS) Service; unposted, cancelled and refunded transactions; and other unauthorized, fraud and abuse transactions. The Rebates will be credited into the Cardholders’ Principal Designated Credit Card accounts within 3 calendar months after each respective calendar month in which the Cardholder fulfils the conditions listed in Clause 4 (“Rebate Fulfillment Period”). All Rebates earnt by the Supplementary Card(s) will be credited into Principal Designated Credit Card accounts. The Rebates accumulated in any monthly statement shall only be used to offset the relevant value of the Octopus Automatic Add Value Transaction(s) posted to any subsequent monthly statement. The Rebates awarded under this Promotion cannot be transferred to another credit card account or exchanged or traded for cash or other offers. Cardholders must keep and submit the relevant original credit card sales slips and original merchant sales receipts in respect of the Eligible Transactions for inspection upon request by Citibank. All documents submitted to Citibank will not be returned. Cardholders’ Designated Credit Card accounts must be valid and with good credit record during the Promotion Period and Rebate Fulfillment Period in order to be eligible to receive the Rebates; otherwise, Citibank reserves the right to forfeit the Rebates without prior notice. In case of any fraud, abuse, reversal or cancellation of Eligible Transactions and the transactions in respect of which the Rebates were awarded, Citibank reserves the right to debit from the Cardholder’s Designated Credit Card account the equivalent amount of Rebates without prior notice. Citibank will determine and verify the eligibility of Cardholders to participate in this promotion, as well as the transactions and entitlement of Cardholders to any and all of the Rebates, based on Citibank’s record. Under no circumstance shall any Cardholder or any other person have any claim or action whatsoever arising out of or in relation to this Promotion against Citibank and/or Octopus Cards Limited and/or any parties in relation to this Promotion. For the purpose of this Promotion, the Octopus ID and transaction data relating to the aggregate amount of the Bus Payments will be disclosed between Octopus Cards Limited, the issuer of the Octopus function of the Designated Credit Card subject to the Conditions of Issue of Octopus published by Octopus Cards Limited (as amended from time to time), and Citibank and will be used by Citibank for identifying and verifying the eligibility of the Cardholders and for fulfillment of the Rebates. Such data used for the said purposes in relation to this Promotion shall be destroyed by July 31, 2020. Citibank reserves the sole and absolute rights to (a) revise these Terms and Conditions, (b) modify, cancel, terminate or suspend any part of this Promotion and/or (c) change or substitute the Rebates or any part thereof under this Promotion at any time without prior notice or reason. All matters and disputes relating to the Promotion are subject to the final decision of Citibank. Citi Octopus Credit Card Octopus Cash Program ("Octopus Cash Program") is only open to the Principal Cardholders of the Card. the Account is in compliance with such conditions as may be imposed by the Company from time to time. The Octopus Cash is not transferable. The Octopus Cash accumulated under the Account will be forfeited when the Account is closed or, in the opinion of the Company, is not in good standing; or if the Card has expired or ceased to be effective or a breach of this Agreement or any other relevant agreement has occurred. Without prejudice to the foregoing, any Octopus Cash credited to the Account which remain unredeemed after a three-year period (or any other period as the Company may prescribe from time to time) will be automatically forfeited. For this purpose, Octopus Cash accumulated under the Account will be deemed to have been redeemed in the order they are credited to the Account. The Company is entitled at any time and without any prior notice or liability to the Principal Cardholder in any manner whatsoever to terminate Octopus Cash Program or cancel or vary its benefits or features, or vary, add to or delete any of the terms and conditions of the Octopus Cash Program, or withdraw or change the participants of Octopus Cash or modify or limit the value of Octopus Cash and/or the manner of their redemption even though any of such acts may diminish the value of Octopus Cash already accumulated. Should any transaction in the monthly statement be cancelled or refunded for whatever reason, the Octopus Cash earned in respect to those transactions will be deducted or cancelled. All matters and disputes will be subject to the final decision of the Company. These terms are translated from English to Chinese for guidance only. If there is any conflict or inconsistency between the two versions, the English version will prevail.